Meaty & juicy wings. Your choice of hot or BBQ served with ranch dressing. Served with lettuce, tomatoes and marinara sauce. Our pizza dough baked to perfection and seasoned with herbs, spices & olive oil, served with marinara sauce. Golden fried calamari served with marinara sauce, lemon & garlic knots. A whole loaf of Italian bread toasted with our special garlic sauce. Mozzarella sticks, fried ravioli, fried calamari, garlic knots & marinara sauce. Soups are made fresh daily! Lettuce, tomatoes, cucumbers, red onions, black & green olives, giardiniera & artichoke. Our garden salad topped with fresh sliced grilled chicken breast & seasoned with herbs and spices. Our garden salad with golden fried chicken breast cutlet. Mix of romaine & iceberg lettuce garnished with croutons, black olives, cherry tomatoes, imported grated cheese & homemade Caesar dressing. Our garden salad with feta cheese & dolma (rice filled grape leaves). Our garden salad topped with ham, salami, mozzarella, & roasted peppers. Fresh tomatoes, fresh mozzarella, fresh basil, slow roasted tomatoes, roasted peppers with extra virgin olive oil & balsamic vinaigrette. Our garden salad topped with buffalo chicken & feta cheese. Our garden salad topped with a generous portion of gyro meat, feta cheese & tzatziki sauce. Pizza dough filled with fresh ricotta, mozzarella & herbs. An open calzone, stuffed with sliced sausage, meatballs, pepperoni & ham. An open calzone stuffed with mushrooms, onions, black olives, red & green peppers & tomatoes. An opened cheese calzone topped with ham. An opened cheese calzone topped with ricotta & spinach. An opened cheese calzone topped with chicken & tomato sauce. Cheese filled calzone topped with mushrooms, pepperoni, onions, sausage & peppers. Chicken breast cutlet, mozzarella cheese & marinara sauce baked in our fresh pizza dough. Plum tomato sauce with fresh basil & roasted garlic. Mild Italian sausage, roasted peppers & onions in our tomato sauce, fresh garlic & olive oil. Penne pasta in creamy pink sauce with a touch of vodka. Penne pesto in our special pesto sauce topped w/ sun dried tomato, olive oil. Baked penne pasta with ricotta cheese, tomato sauce & melted cheese. A generous portion of baked ziti, topped with sliced pepperoni, ham, meatballs & sausage. Baked penne pasta with ricotta cheese, tomato sauce, melted mozzarella & eggplant. Our baked ziti generously topped with pepperoni & mushrooms. Fresh pasta stuffed with ricotta cheese & topped with tomato sauce & melted mozzarella. Pasta shells with ricotta cheese, topped with tomato sauce & melted mozzarella. Fresh pasta layered with our beef meat sauce & ricotta cheese, topped with tomato sauce & melted mozzarella. Served with warm bread & butter. Cheese filled ravioli in our light classic pink creamy sauce. Filled with ricotta cheese & topped with tomato sauce & melted mozzarella. Stuffed with ground beef, topped with tomato sauce & melted mozzarella. Spinach filled ravioli baked to perfection in our special pesto sauce. Served with a side dish of pasta or garden salad, warm bread & butter. Chicken breast with sauteed mushrooms, onions & roasted peppers. Finished in our marinara sauce. Fried eggplant topped with tomato sauce & melted mozzarella. Eggplant topped with sauteed broccoli, spinach, mushrooms & plum tomatoes. Finished with tomato sauce & ricotta cheese. Eggplant rolled with ricotta cheese then topped with tomato sauce and melted mozzarella. Breaded fried chicken cutlet topped with tomato sauce & mozzarella. Breaded fried chicken cutlet topped with tomato sauce. Breaded veal cutlet topped with tomato sauce & melted mozzarella. Veal cutlet topped with sauteed peppers & mushrooms in a marinara sauce. The Best In The Business - With Lots of Meat! Served with lettuce, tomatoes, red onions & Tzatziki sauce. Served with lettuce, tomatoes, red onions, Tzatziki sauce, pita bread & fries. Butterflied breaded jumbo shrimp in our marinara sauce, topped with mozzarella. Jumbo shrimp sauteed with fresh garlic in our spicy marinara sauce. Shrimp sauteed in garlic & marinara sauce. Grilled chicken with romaine lettuce, onions, Caesar dressing & grated parmesan. Chicken cutlet with lettuce, tomatoes, black olives, feta cheese & Caesar dressing. Mushrooms, roasted peppers, broccoli, fresh mozzarella & balsamic vinaigrette. Chicken cutlet with lettuce, tomatoes, onion, parmesan cheese, hot sauce & ranch. Lettuce, tomatoes, onion & ranch. Full body, blackberry and oak with medium tannins. Medium body, bright cherry with hints of leather. Full body, red berry & blackberry with hints of fruit & spice. Medium body, citrus and apple, refreshing. Neapolitan (round) or Sicilian (square) 16" x 16"
Did You Know? We make our own pizza dough, pizza sauce, and pasta sauce fresh everyday on the premises. 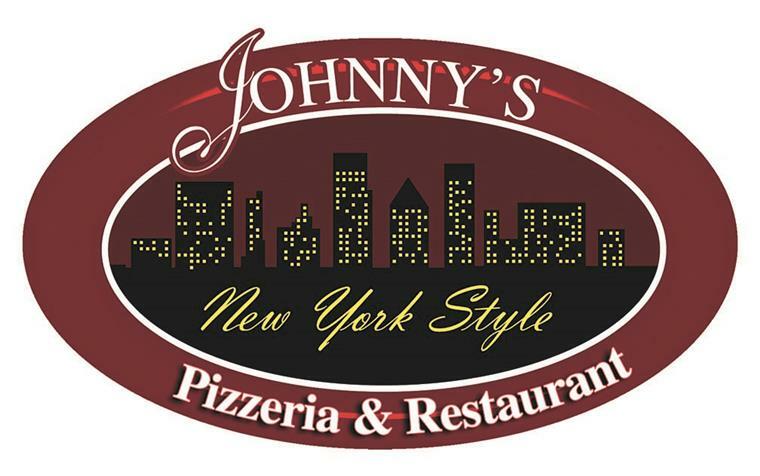 We here at Johnny's have the best & biggest pizza in Virginia. With romaine lettuce, plum tomatoes, cucumber, onions, fresh basil, artichoke, black olives, fresh mozzarella, mayo & dressing. Jumbo butterflied shrimp with marinara sauce & mozzarella cheese. With lettuce, tomatoes, mayo, red onions, roasted peppers and dressing. With lettuce, tomatoes, mayo, red onions, roasted peppers & dressing. Hot or cold served with lettuce, tomatoes, mayo, red onions & dressing. Lettuce, tomatoes, mayo, red onion, roasted peppers, ham, salami, fresh mozzarella & dressing. With lettuce, tomatoes, mayo, onions & dressing. With Lettuce, tomatoes, mayo, grilled onions, peppers and special herbs & spices. Pepperoni, meatballs, sausage, peppers, onions, mushrooms & black olives (anchovies optional). Fresh plum tomatoes, fresh mozzarella, fresh basil, fresh garlic olive oil & mozzarella. Fresh spinach, mozzarella cheese, ricotta cheese & herbs. Ricotta cheese, mozzarella cheese, Romano cheese & herbs. Our cheese pizza topped with fresh fried eggplant, marinara sauce & ricotta cheese. Chicken breast marinated in our spicy buffalo sauce, ranch and mozzarella cheese. Mushrooms, onions, red & green peppers, broccoli, fresh tomatoes, black olives & eggplant. Plum tomatoes with onions, fresh basil, fresh garlic, feta cheese & sun-dried tomatoes. Sliced meatballs, bacon, jalapenos, cheddar cheese & mozzarella cheese. "This is a heavy duty one" Pizza with penne pasta, marinara sauce, lots of mozzarella cheese & topped with ricotta cheese. Chicken breast in a pink creamy sauce, a touch of vodka & mozzarella cheese. Our cheese pizza topped generously with chicken cutlet, tomato sauce & mozzarella cheese. Our cheese pizza topped with ham, pineapple & extra cheese. Homemade meatballs, Italian sausage, pepperoni, ham & extra cheese. Lots of mozzarella cheese, fresh plum tomatoes, red onions & parsley marinated with special herbs & spices. Our cheese pizza topped with shrimp, marinated in our special recipe sauce. Philly's original steak, red & green peppers, onions, marinated in our special garlic sauce & topped with mozzarella cheese. Grilled chicken topped with mozzarella cheese, ranch & BBQ sauce, baked to perfection. Sicilian pizza topped with our homemade plum tomato marinara sauce, fresh basil, & sprinkled with grated Romano cheese (no mozzarella cheese). Grilled chicken topped mozzarella cheese and mango chili sauce, baked to perfection. Grilled chicken with our homemade Alfredo sauce, mozzarella cheese and a touch of sun-dried tomatoes. Our cheese pizza topped with sausage, peppers and onions with a mild touch of spices.